Vertebroplasty is a minimally invasive spinal surgical procedure to treat vertebral compression fractures caused by weakened bones. Vertebral compression fractures occur when bones in the spine break which happens due to trauma, such as a car accident or fall, but are most commonly the result of osteoporosis which causes weakened bones. Compression fractures can also be caused by other bones weakening conditions such as certain cancers or long term steroid use. A Vertebroplasty surgical procedure is performed to stabilize a spinal fracture, thus stopping the pain caused by the fracture itself. he surgery is performed under sterile conditions in the operating room with the patient under general or local anesthesia and lying face down on the operating table. Your doctor will make a very small puncture in the skin over the fracture site. This procedure does not require incisions. Under live X-ray guidance, a hollow needle is introduced through the back where it is positioned within the fractured vertebrae. Medical grade bone cement is then injected into the area through the needle. X-rays or CT scans may be done to confirm effective distribution of the bone cement. The needle is then withdrawn, pressure is applied, and a sterile bandage is placed. 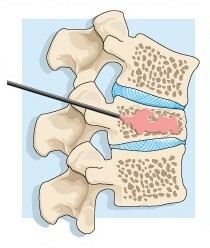 Many patients feel immediate pain relief following a vertebroplasty procedure. For others, it may take a few days or weeks before showing improvement. Most patients are discharged home the very same day of the surgery. Please follow the below recommendations after your surgery. You should rest in bed for the first 24 hours but can get up to use the bathroom. Pain medication will be given to make you comfortable for the first few days. Ice packs placed over a cloth can be applied to the surgical area for 20 minutes every hour. You will be restricted from heavy lifting or strenuous activities for the first 6 weeks. A postoperative rehabilitation program may be prescribed by your doctor to strengthen spinal muscles two weeks after your surgery.